Zodwa Nyoni’s third production for West Yorkshire Playhouse may be entitled Ode to Leeds but it’s also a celebration of adolescence. It’s a time where emotions are heightened and the world stretches out before you. Nyoni has drawn upon her own experiences as a member of poetry group Leeds Young Authors to tell the tale of five young friends who form a similar collective and decide to compete in a prestigious poetry slam contest in New York. From the moment the five launch into their first poem, there’s an air of electricity and vibrancy to James Brining’s production that never dims over the course of two hours. Though Brining makes intelligent use of back projections and of Lucy Sierra’s split level staging, it’s the chemistry between the cast that gives Ode to Leeds its power. Nyoni’s characters are all believable, normal kids – from the reluctant leader Queenie, to the loveable rogue Mack and the talented but troubled poet Darcy. The performances of the young cast feel fresh and natural. Leah Walker, as Darcy, has an outstanding voice while the intensity of Genesis Lynea’s rendition of Black Girl is something to behold. The poems touch on subjects both personal and political, while the contemporary soundtrack also helps to make the production accessible and inviting to a young audience. 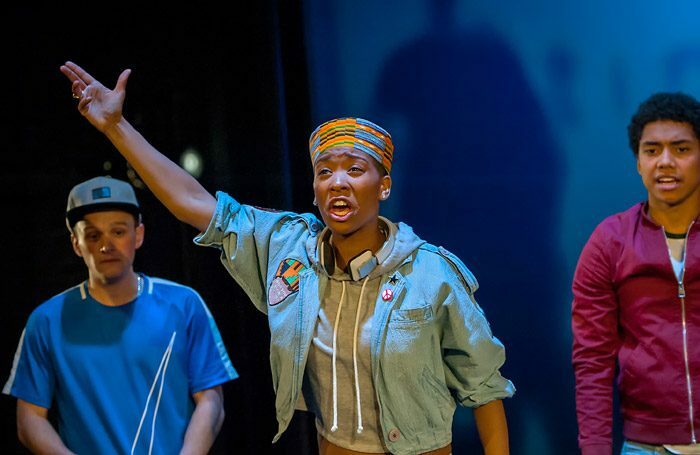 Those same teenagers leave the theatre with their eyes shining with excitement and inspiration as they discuss how to unlock their own potential – and that’s Nyoni’s greatest achievement here.